Mother Kali depicted dancing on Lord Shiva. 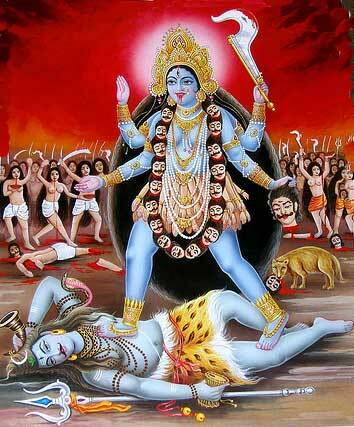 Mother Kali is the consort of Lord Shiva. Lord Shiva is the silent aspect of the Transcendental Reality, and Mother Kali is the dynamic aspect of the Transcendental Reality. Truth is complete when it is both dynamic and silent. Truth is complete when the dynamic aspect and the silent aspect function together. In the Upanishads it says: “That is far and at the same time, that is near. That moves and that moves not. That is within and that is without. It moves and it moves not.” When Kali is performing her role, reality is moving. When Shiva is performing, reality is silent. When they perform together, that moves and that moves not. With our human consciousness, when we try to see the Truth, it is far, very far. But with our divine consciousness, when we try to see the Truth, it is all near; it is right in front of our nose. “That is within and that is without.” These conflicting terms cease when our inner consciousness is fully awakened. If something is within, then that very thing also has to be without. If there is a seed, then there will be a tree. If there is a tree, there also is a seed. If the Truth is already there within, then the Truth has to be manifested sooner or later outside. Mother Kali is the dynamic aspect of the Transcendental Truth and Lord Shiva is the silent aspect of the highest Transcendental Truth. They fulfil the highest Supreme together, like the obverse and the reverse of the same coin. Shiva is silent and Kali is active and dynamic. If we see with our ordinary human eyes, then we say that they are separate. But with our inner eye if we see them, we see that they are together. Another story from Indian tradition, which gives insight on Shiva and Kali. “In the beginning, Shankaracharya did not pay attention to women. He felt that women were not suited to spirituality. Then, when he was about to lose the debate to Bharatishastri, it dawned on him that Mother Kali was on Lord Shiva’s chest.